UDP-glucuronosyltransferases (UGTs) catalyze the addition of UDP-glucuronic acid to endo- and xenobiotics, enhancing their water solubility and elimination. Many exogenous compounds, such as microsomal enzyme inducers (MEIs), alter gene expression through xenobiotic-responsive transcription factors, namely, the aryl hydrocarbon receptor (AhR), constitutive androstane receptor (CAR), pregnane X receptor (PXR), peroxisome proliferator-activated receptor α (PPARα), and nuclear factor erythroid 2-related factor 2 (Nrf2). These transcription factors regulate xenobiotic-inducible expression of hepatic and intestinal biotransformation enzymes and transporters. The purpose of this study was to determine hepatic and intestinal inducibility of mouse Ugt mRNA by MEIs. Male C57BL/6 mice were treated for four consecutive days with activators of AhR [2,3,7,8-tetrachlorodibenzodioxin (TCDD), polychlorinated biphenyl 126, and β-naphthoflavone], CAR [1,4-bis[2-(3,5-dichloropyridyloxy)]benzene (TCPOBOP), phenobarbital, and diallyl sulfide], PXR [pregnenolone-16α-carbonitrile (PCN), spironolactone, and dexamethasone], PPARα (clofibrate, ciprofibrate, and diethylhexylphthalate), and Nrf2 (oltipraz, ethoxyquin, and butylated hydroxyanisole), respectively. Ugt1a1 mRNA expression in liver was induced by activators of all five transcription factor pathways, Ugt1a5 by Nrf2 activators, Ugt1a6 by all the pathways except CAR, and Ugt1a9 by all the pathways except Nrf2. Ugt2b35 mRNA in liver was induced by AhR activators and Ugt2b36 by CAR and PPARα activators. Throughout the small and large intestine, the AhR ligand TCDD increased Ugt1a6 and Ugt1a7 mRNA. In small intestine, the PXR activator PCN increased Ugt1a1, Ugt1a6, Ugt1a7, Ugt2b34, and Ugt2b35 mRNA in the duodenum. In conclusion, chemical activation of AhR, CAR, PXR, PPARα, and Nrf2 in mouse results in induction of distinct Ugt gene sets in liver and intestine, predominantly the Ugt1a isoforms. Humans and other animals are constantly exposed to a variety of natural and manmade non-nutrient chemicals through the intake of air, food, drinks, drugs, and supplements. These chemicals must be eliminated from the body because they can be toxic to cells and tissues. Therefore, detoxification mechanisms, such as biotransformation enzymes and transporters, are important for the elimination of these chemicals. Among the biotransformation enzymes vital for detoxification are UDP-glucuronosyltransferases (UGTs). UGTs are a superfamily of phase II biotransformation enzymes that catalyze the conjugation of numerous endo- and xenobiotics. Glucuronidation reactions, generally regarded as detoxification reactions, use the high-energy cosubstrate UDP-glucuronic acid to convert chemicals into predominantly water-soluble molecules more readily cleared by excretion through bile or urine. In humans, rats, and mice, UGTs are expressed in numerous tissues, most notably liver, small and large intestine, and kidney. In addition, UGTs are expressed in lung, stomach, olfactory epithelium, brain, heart, and steroid-sensitive tissues such as testis, ovary, uterus, and mammary gland (King et al., 2000; Tukey and Strassburg, 2000; Shelby et al., 2003; Buckley and Klaassen, 2007). UGTs conjugate a broad range of substrates including endogenous molecules, such as bilirubin, thyroid hormones, androgens, and estrogens, as well as numerous xenochemicals including dietary flavinoids, phenols, non-steroidal anti-inflammatory drugs, and so on (Dutton, 1980; King et al., 2000; Tukey and Strassburg, 2000). Treatment of animals with some foreign compounds, such as microsomal enzyme inducers (MEIs), increases biotransformation enzyme activity. Molecular mechanisms behind the induction of detoxification enzymes by MEIs have been characterized for cytochromes P450. Most notably, the orphan nuclear receptors constitutive androstane receptor (CAR) and pregnane X receptor (PXR) have been identified as molecular targets for xenobiotics to increase transcriptional activity of phase I detoxification enzymes, CYP2B and CYP3A, respectively (Bertilsson et al., 1998; Honkakoski and Negishi, 1998). CAR is both constitutively active and inducible by xenobiotics, such as the antiepileptic drug phenobarbital (PB) and 1,4-bis[2-(3,5-dichloropyridyloxy)]benzene (TCPOBOP). CAR regulates gene expression through binding to the NR-1 site within the PB response element of the Cyp2b10 promoter (Honkakoski and Negishi, 1998; Xie et al., 2000; Yoshinari et al., 2003). PXR controls human and rodent CYP3A induction through direct ligand binding by compounds such as pregnanes, glucocorticoids, and xenobiotics (Bertilsson et al., 1998; Kliewer et al., 1998). CAR and PXR share overlapping and redundant substrate specificity and target gene induction; however, both mediate individual pathways critical for detoxification (Xie et al., 2000). Not surprisingly, human UGT1A1, the major bilirubin-conjugating enzyme, is transcriptionally regulated by both PXR and CAR through DR-3 and NR-1 elements in the 5′-promoter (Sugatani et al., 2001; Xie et al., 2003). Regulation of other UGTs by CAR and PXR has been reviewed (Mackenzie et al., 2003; Zhou et al., 2005). In addition to CAR and PXR, the nuclear receptor peroxisome proliferator-activated receptor α (PPARα) controls transcriptional activation of UGTs. On ligand binding, PPARα heterodimerizes with RXR and can bind the PPAR response elements. PPARα is responsible for the induction of CYP4A and genes involved in fatty acid β-oxidation, and is activated by fatty acids and hypolipidemic drugs, such as the fibrates (Muerhoff et al., 1992; Keller et al., 1993). In addition to members of the nuclear receptor family, other transcription factors are involved in the transcriptional response to xenobiotic exposure, namely, the aryl-hydrocarbon receptor (AhR) and nuclear factor erythroid 2-related factor 2 (Nrf2). AhR, a helix-loop-helix protein, is liganded by polyaromatic hydrocarbons and dioxin, inducing expression of phase I CYP1A enzymes and phase II enzymes, glutathione-S-transferases, and UGTs (Hankinson, 1995; Schmidt and Bradfield, 1996). Nrf2 becomes activated in response to cellular oxidative stress. Nrf2 is sequestered in the cytosol by Keap-1, where Nrf2 is targeted for ubiquitination. On oxidative modification of Keap-1 or phosphorylation of Nrf2, free Nrf2 (unbound to Keap-1) translocates into the nucleus, heterodimerizing with Maf proteins to induce transcription of enzymes that protect the cell from oxidative damage. Nrf2 target genes include NADPH quinone oxidoreductase (NQO1), glutathione-S-transferases, and UGTs (Itoh et al., 1997, 2004). To date, several studies have examined the consequences of activating the aforementioned transcription factors and their role in inducing phase I and II biotransformation enzymes. Many studies have used human cell lines, rats, or transgenic mice to explore the mechanisms of enzyme induction. For UGT1A1, significant work has revealed numerous transcriptional activation sites in the human, as well as mouse, UGT1A1 promoter. Likewise, induction of UGT1A6 and UGT1A9 has been explored extensively in humans and rats. However, as many scientists transition to the mouse model to elicit molecular mechanisms, few data are available for the induction of mouse Ugts other than Ugt1a1. Therefore, the purpose of this study was to provide a full characterization of mouse Ugt mRNA induction by activators of AhR, CAR, PXR, PPARα, and Nrf2 in both liver and intestine. Chemicals. 2,3,7,8-Tetrachloro-dibenzodioxin (TCDD) was a gift from Dr. Karl Rozman (University of Kansas Medical Center, Kansas City, KS). Polychlorinated biphenyl 126 (PCB126) was purchased from AccuStandard (New Haven, CT). Oltipraz (OPZ) was a gift from Dr. Steven Safe (Texas A&M University, College Station, TX). All of the other chemicals were purchased from Sigma-Aldrich (St. Louis, MO). Animals and Chemical Treatment. Eight-week-old male C57BL/6 mice were purchased from Charles River Laboratories, Inc. (Wilmington, MA). Animals were housed according to the American Animal Association Laboratory Animal Care guidelines. Mice were allowed food (Teklad Rodent Diet 8064; Harlan-Teklad, Madison, WI) and water ad libitum, and were acclimated to the housing facility for 1 week before treatment. Mice were treated as controls (saline, intraperitoneal; corn oil, intraperitoneal and oral) or an activator of AhR, CAR, PXR, PPARα, or Nrf2, as detailed in Table 1. Selection of chemical activators and dosing regimens were based on previous studies that examined the mRNA expression of mouse hepatic transporters and target genes of the five transcription factors examined in the current study (i.e., AhR, Cyp1a1; CAR, Cyp2b10; PXR, Cyp3a11; PPARα, Cyp4a14; and Nrf2, Nqo1) (Cheng et al., 2005). Doses were selected based on the ability to effectively activate each of the five transcription factors and induce target gene mRNA expression in mouse liver. Mice were dosed once daily for four consecutive days in a volume of 5 ml/kg, and tissues were harvested on day 5. Liver, duodenum, jejunum, ileum, and colon were removed and immediately frozen in liquid nitrogen and stored at –80°C. Intestine was rinsed with saline before freezing. Chemicals are sorted by prototypical pathways. Abbreviations, doses, vehicle, and route of administration are also listed. Total RNA Isolation. Total RNA was extracted from each tissue using RNA-Bee Reagent (Tel-Test Inc., Friendswood, TX) according to the manufacturer's protocol. RNA was quantified by UV spectrophotometry at 260/280 nm and diluted to 1 μg/μl in diethyl pyrocarbamate-treated water. RNA samples were analyzed by formaldehyde-agarose gel electrophoresis, and integrity was confirmed by visualization of 18S and 28S rRNA bands. Branched DNA Signal Amplification Assay. Individual mouse Ugt mRNA transcripts were detected using the QuantiGene branched DNA (bDNA) signal amplification assay (Panomics, Fremont, CA). Probe sets for mouse Ugt transcripts were described previously (Chen et al., 2003; Buckley and Klaassen, 2007). Probes for Cyp1a1, Cyp2b10, Cyp3a11, Cyp4a14, and Nqo1 were also described previously (Cheng et al., 2005). The bDNA assay was performed as described and validated previously (Hartley and Klaassen, 2000). In brief, capture extender, label extender, and blocker probes were combined and diluted into lysis buffer. Total RNA (1 μg/μl; 10 μl) was added to each well of 96-well plates containing 50 μl of capture hybridization buffer and 50 μl of diluted probe set, and allowed to hybridize at 53°C overnight. Plates were cooled to 46°C and rinsed twice with wash buffer. Amplifier reagent (100 μl), diluted 1:1000 in amplifier/label probe buffer, was added to each well and incubated at 46°C for 1 h. Plates were rinsed again with wash buffer and label reagent (100 μl), diluted 1:1000 in amplifier/label probe buffer, and incubated at 46°C for 1 h. Plates were rinsed in wash buffer, and substrate reagent (100 μl) was added to each well. Alkaline phosphatase luminescence was activated by the addition of dioxetane substrate reagent. Plates were incubated for 1 h at 37 °C, and luminescence was quantified with a Quantiplex 320 bDNA Luminometer (Panomics, Inc.). Analysis of luminescence from the 96-well plates was performed by Quantiplex Data Management Software version 5.02 (Panomics, Inc.). Luminescence for each well is reported as relative light units per 10 μg of total RNA. Messenger RNA expression of Cyp1a1, Cyp2b10, Cyp3a11, Cyp4a14, and Nqo1 by the bDNA assay in male mouse livers treated with activators of AhR, CAR, PXR, PPARα, and Nrf2, respectively (n = 5/treatment). Data are expressed as -fold induction compared with vehicle controls. Values are expressed as mean ± S.E.M. Asterisks (*) indicate statistically significant differences between control and treatment groups (p ≤ 0.05). Statistical Analysis. Data are presented as a mean with bars representing S.E.M. Statistical differences between control and treatment groups were determined by a one-way analysis of variance followed by Duncan's multiple range post hoc test. Statistical differences between a control group and a single treatment group were determined by a two-tailed Student's t test. Asterisks represent statistical differences (p ≤ 0.05) in mRNA levels between control and treatment groups. Activation of Transcription Factor Pathways. To determine whether treatments (Table 1) sufficiently and effectively activated each specific transcription factor pathway, induction of mRNA expression target genes for each pathway was determined by bDNA in liver (Fig. 1). Cyp1a1 mRNA, a marker of AhR activation, was induced in liver by TCDD, PCB126, and β-naphthoflavone (β-NF). The CAR target gene, Cyp2b10, was increased by TCPOBOP, diallyl sulfide (DAS), and PB. PXR target gene, Cyp3a11, mRNA was induced by pregnenolone-16α-carbonitrile (PCN), spironolactone (SPR), and dexamethasone (DEX). All the PPARα activators, clofibrate (CLFB), ciprofibrate (CPFB), and diethylhexylphthalate (DEHP), increased expression of Cyp4a14, and all the Nrf2 activators, OPZ, ethoxyquin (ETHOXYQ), and butylated hydroxyanisole (BHA), increased Nqo1 mRNA expression. Messenger RNA expression of Ugt1a1, Ugt1a5, Ugt1a6, and Ugt1a9 in livers of male mice treated with three activators of AhR, CAR, PXR, PPARα, and Nrf2 (n = 5/treatment) by the bDNA assay. Data are expressed as percentage control. Values are expressed as mean ± S.E.M. Asterisks (*) indicate statistically significant differences between control and treatment groups (p ≤ 0.05). Ugt1a mRNA Induction in Mouse Liver.Figure 2 illustrates the effects of all 15 treatments on the Ugt1a transcripts that are basally expressed in liver of C57BL/6 mice, in particular Ugt1a1, Ugt1a5, Ugt1a6, and Ugt1a9 (Buckley and Klaassen, 2007). In liver, each of the aforementioned genes was induced by at least one class of transcriptional activator. Ugt1a1 mRNA expression was increased by at least two of three activators of each transcriptional pathway. AhR ligands TCDD, PCB126, and β-NF increased Ugt1a1 expression 47 to 81%, as did CAR activators TCPOBOP and PB, both by 68%. Ugt1a1 mRNA expression was increased by PXR activators PCN and SPR, 47 and 86%, respectively, but was decreased by DEX to 47% of control. PPARα activators CPFB and DEHP produced the most marked increase in Ugt1a1 expression, 90 and 108%, respectively. All three Nrf2 activators, OPZ, ETHOXYQ, and BHA, increased Ugt1a1 expression in liver 40, 66, and 78%, respectively. Ugt1a5 mRNA expression was increased by two Nrf2 activators, OPZ and ETHOXYQ, 137 and 172%, respectively. Ugt1a5 mRNA was increased by β-NF and SPR (Fig. 2). Ugt1a6 mRNA was increased by at least two of three activators of AhR, PXR, PPARα, and Nrf2 (Fig. 2). AhR ligands TCDD, PCB126, and β-NF resulted in the most profound increases in Ugt1a6 mRNA expression of 197, 133, and 89%, respectively. Ugt1a6 was modestly increased by one CAR activator, DAS, in liver by 71%. PXR activators PCN and SPR (54 and 64%) increased Ugt1a6 mRNA, as did PPARα activators CLFB, CPFB, and DEHP (112, 74, and 95%) and Nrf2 activators OPZ and BHA (67 and 116%). Messenger RNA expression of Ugt1a2, Ugt1a7, and Ugt1a10 in livers of male mice treated with three activators of AhR, CAR, PXR, PPARα, and Nrf2 (n = 5/gender) by the bDNA assay. Data are expressed as percentage control. Values are expressed as mean ± S.E.M. Asterisks (*) indicate statistically significant differences between control and treatment groups (p ≤ 0.05). Ugt1a9 mRNA was induced by at least two of three activators of AhR, CAR, PXR, and PPARα (Fig. 2). AhR ligands again produced the most marked increases of 504, 313, and 265% for TCDD, PCB126, and β-NF, respectively. Ugt1a9 mRNA expression was also increased by CAR activators TCPOBOP and DAS (86 and 96%), PXR activators PCN, SPR, and DEX (94, 138, and 283%), and PPARα activators CLFB and CPFB (148 and 142%). Ugt1a2, Ugt1a7, and Ugt1a10 are extrahepatic mouse Ugt isoforms expressed at very low levels in untreated liver. The effects of the 15 chemicals on mRNA levels of these Ugts are illustrated in Fig. 3. None of the extrahepatic genes exhibited overall induction by any class of compound, defined as induction by at least two of three activators of a specific transcriptional pathway. However, Ugt1a2 mRNA expression in liver was increased by treatment with SPR. Ugt2b mRNA Induction in Mouse Liver. The effects of the chemical activators of transcription factors on mouse Ugt2b mRNA expression are shown in Fig. 4. Ugt2b1 mRNA expression was not induced by any treatment; however, Ugt2b1 was decreased by two Nrf2 activators, OPZ and BHA, as well as the AhR ligand TCDD. Ugt2b35/37/38 was not increased or decreased by any chemical treatment. Ugt2b34 mRNA was increased by two compounds, TCPOBOP and PCN, by 106 and 65%, respectively. Ugt2b35 mRNA was increased by two of three activators of AhR, namely, TCDD and PCB126, by 71 and 99%, respectively. DAS and PCN also increased Ugt2b35 mRNA expression in liver. Lastly, Ugt2b36 mRNA was induced by all three activators of CAR and PPARα, ranging from 55 to 73%. In addition, Ugt2b36 mRNA expression was increased by SPR in liver. Ugt2a3 and Ugt3a1/2 mRNA Induction in Mouse Liver. Ugt2a3 and Ugt3a1/2 are the two non-Ugt1a or -Ugt2b Ugt transcripts expressed in mouse liver. Mouse hepatic Ugt2a3 was decreased by two activators of both AhR and CAR (Fig. 5). TCDD and β-NF, as well as TCPOBOP and DAS, decreased Ugt2a3 mRNA 35 to 40% in liver. Ugt3a1/2 mRNA was decreased approximately 45% by two CAR activators, TCPOBOP and DAS. Neither Ugt2a3 nor 3a1/2 was increased by any of the 15 treatments. Induction of Ugt mRNA in Mouse Intestine. Intestines were collected from male mice treated with the prototypical activator of each transcription pathway, TCDD, TCPOBOP, PCN, CLFB, and BHA. Small intestine was divided into thirds and classified as duodenum, jejunum, and ileum (proximal to distal). Colon was also collected. 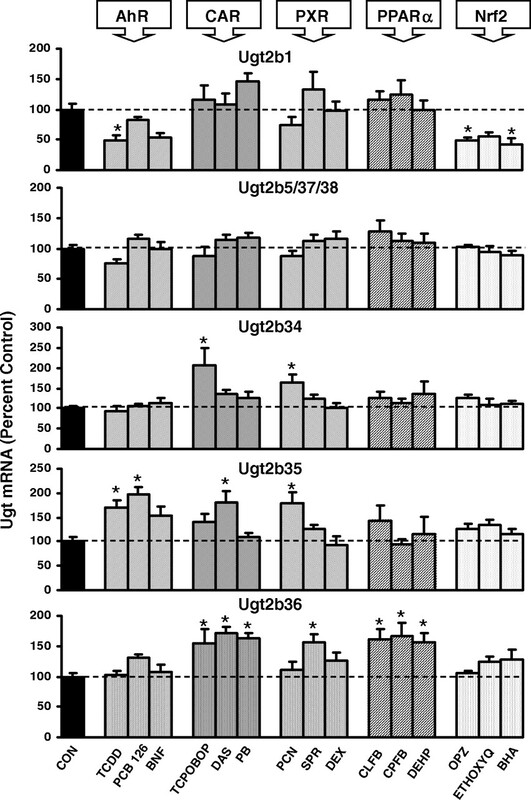 Ugt mRNA expression was quantified in all four portions of intestine from mice treated with each of the five aforementioned inducers and controls (Fig. 6). Intestinal RNA samples within a single treatment group (n = 5 mice/group) were pooled into a single sample before performing the bDNA assay on the six Ugt transcripts previously detected in mouse intestine, namely, Ugt1a1, Ugt1a6, Ugt1a7, Ugt2a3, Ugt2b34, and Ugt2b35 (Buckley and Klaassen, 2007). From the results illustrated in Fig. 5, two major trends were observed: 1) TCDD increased Ugt1a6 and Ugt1a7 in duodenum, jejunum, ileum, and colon; and 2) PCN increased all six Ugt transcripts examined in duodenum. For these groups, the bDNA assay was repeated using individual rather than pooled samples (Fig. 7). Messenger RNA expression of Ugt2b1, Ugt2b5/37/38, Ugt2b34, Ugt2b35, and Ugt2b36 in livers of male mice treated with three activators of AhR, CAR, PXR, PPARα, and Nrf2 (n = 5/gender) by the bDNA assay. Data are expressed as percentage control. Values are expressed as mean ± S.E.M. Asterisks (*) indicate statistically significant differences between control and treatment groups (p ≤ 0.05). Ugt1a6 mRNA expression in the duodenum, jejunum, ileum, and colon was increased by TCDD, showing 106, 213, 329, and 67% increases, respectively (Fig. 7A). Ugt1a7 mRNA expression was increased by TCDD in intestine as well, showing 132, 131, 240, and 70% increases from duodenum to colon (Fig. 7B). 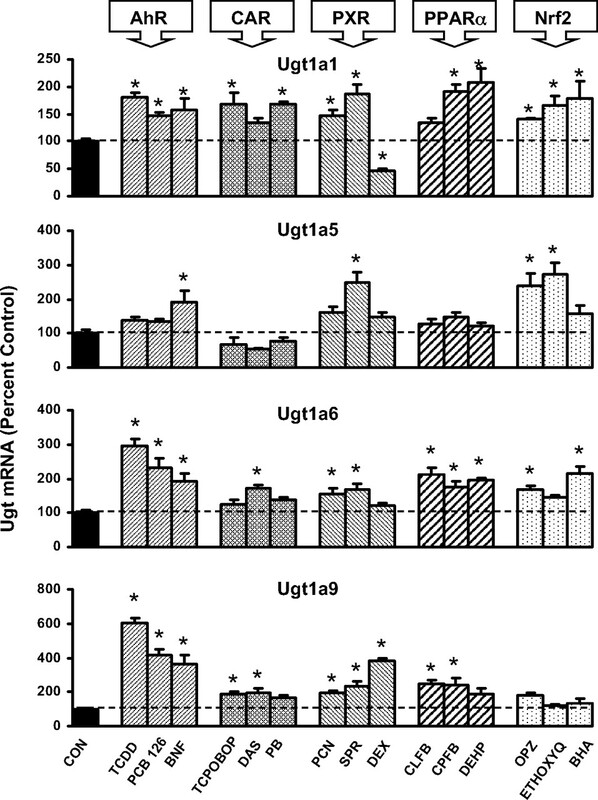 PCN increased mRNA expression of Ugt1a1, Ugt1a6, Ugt1a7, Ugt2b34, and Ugt2b35 in duodenum (Fig. 7C); however, PCN-induced increases of the aforementioned transcripts in duodenum were modest, ranging from 50 to 130%. UGTs, as well as other phase II biotransformation reactions, such as glutathione conjugation and sulfation, are essential for defense from exposure to xenobiotics and endogenous waste products and signaling molecules. Conjugation and detoxification, or signal termination in the case of steroids, are critical to prevent cellular damage from potentially toxic chemicals. Under normal physiological conditions, cells express a homeostatic or basal level of detoxification enzymes required for defense against endogenous byproducts and oxidative stress formed during normal cellular metabolism. However, exposure to xenobiotics requires cells to enhance their defense, thus resulting in an increased expression and functional utilization of detoxification enzymes. Xenochemicals and some endogenous molecules induce enzyme expression by acting as ligands or activators of cellular pathways, leading to increased gene transcription, most notably through nuclear receptor mechanisms. In this study, the effects of prototypical activators of xenobiotic-inducible transcriptional pathways on mouse Ugt mRNA expression were determined. 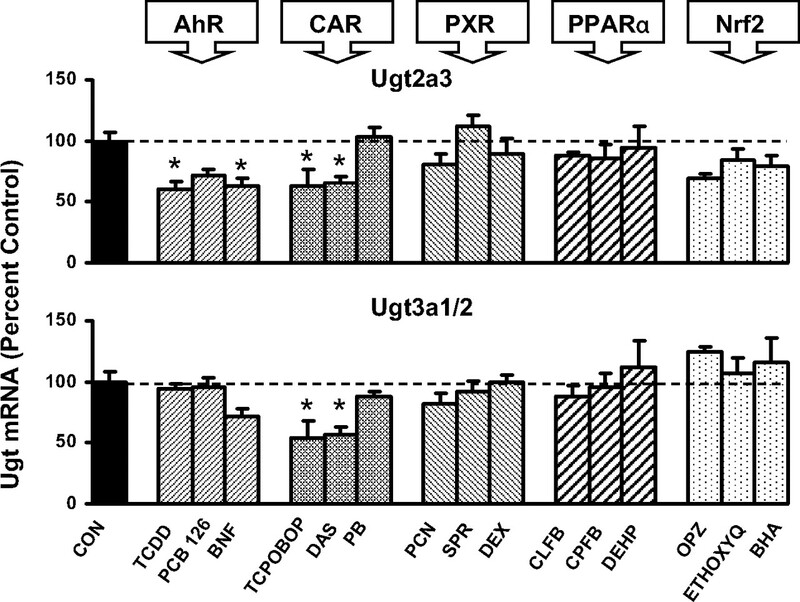 Activators of AhR, CAR, PXR, PPARα, and Nrf2 were used to determine which transcriptional pathways can induce individual Ugt isoforms on xenobiotic exposure (Table 2). Messenger RNA expression of Ugt2a3 and Ugt3a1/2 in livers of male mice treated with three activators of AhR, CAR, PXR, PPARα, and Nrf2 (n = 5/gender) by the bDNA assay. Data are expressed as percentage control. Values are expressed as mean ± S.E.M. Asterisks (*) indicate statistically significant differences between control and treatment groups (p ≤ 0.05). The most common transcription factors associated with xenobiotic metabolism are PXR and CAR, whose activation by foreign and endogenous chemicals results in the subsequent increase of mRNA expression of drug-metabolizing enzymes and transporters. PXR activators induced mRNA expression of hepatic Ugt1a1, Ugt1a6, and Ugt1a9 in mice. These results are not surprising. Our laboratory previously reported that Ugt1a1 and Ugt1a9 mRNA induction by PCN is PXR-dependent using PXR-null mice (Chen et al., 2003). Ugt1a6 was not significantly induced in the aforementioned study, but differences in dose and route (food versus intraperitoneal injection) may explain the differential induction in Ugt1a6 in liver. Mice overexpressing human PXR exhibited significant induction of Ugt1a1 and Ugt1a6 mRNA and protein; likewise, Ugt1a1 mRNA is increased in humanized PXR mice treated with rifampin (Sonoda et al., 2003; Xie et al., 2003). In rats, UGT1A1 mRNA is also increased by PXR ligands (Shelby and Klaassen, 2006). In addition, human UGT1A1 is induced by rifampin in HepG2 cells overexpressing PXR, and confirmed by electrophoretic mobility shift assay and site-directed mutagenesis that PXR/RXR binds to a DR-3 in the hUGT1A1 promoter (Xie et al., 2003). In addition, human UGT1A3, UGT1A4, UGT1A6, and UGT1A9 are induced by activation of PXR (Zhou et al., 2005). In the current study, PCN induced several mouse Ugt genes in duodenum. PCN induces glucuronidation activity in rat intestine (Goon and Klaassen, 1992). More recently, humanized UGT1A transgenic mice revealed that PCN induces UGT1A1 and UGT1A4 in small intestine at the mRNA and protein level, resulting in increased glucuronidation activity after PCN treatment (Chen et al., 2005). In the present study, mouse Ugt1a1, Ugt1a6, Ugt1a7, Ugt2b34, and Ugt2b35 mRNA were increased by PCN in the duodenum. The same trend was not observed in more distal portions, specifically the jejunum, ileum, and colon. A previous report suggests DEX induction of human UGT1A1 in HepG2 cells occurs through mechanisms involving CAR, PXR, and glucocorticoid receptor in the promoter region, and further suggests a role for the transcriptional coactivator glucocorticoid receptor-interacting protein-1 in mediating the response (Sugatani et al., 2005). In the present study, mouse Ugt1a1 mRNA was decreased by DEX treatment. More studies should be performed to determine whether Ugt1a1 mRNA repression by DEX in mice is species-, strain-, or dose-dependent. Xenobiotics can also activate CAR, enhancing transcription of CYP2B and UGTs. CAR mediates PB induction of human UGT1A1 in HepG2 cells by binding to an NR1 site of the PB response element module located within the UGT1A1 promoter region (Sugatani et al., 2001). In rat liver, CAR activators increase mRNA expression of UGT1A1, UGT1A5, UGT1A6, UGT2B1, and UGT2B12 (Shelby and Klaassen, 2006). In mice overexpressing CAR, Ugt1a1 is up-regulated (Saini et al., 2005). In addition, TCPOBOP induction of mouse Ugt1a1 in vivo is ablated in CAR-null mice (Huang et al., 2003). In this study, activators of CAR increased mRNA expression of not only Ugt1a1 but also Ugt1a9 and Ugt2b36 as well. Induction of bilirubin-conjugating Ugt1a1 in liver supports increased bilirubin clearance in CAR-activated mice (Huang et al., 2003). It is interesting to note that the mouse Ugt2b1 was not increased by CAR activators, contrary to its rat ortholog, UGT2B1 (Shelby and Klaassen, 2006). This observation suggests differential induction between species, resulting from perhaps differences within proximal promoter elements. In contrast to CAR activators increasing expression of a number of Ugts, the activators decreased the mRNA expression of Ugt2a3 and Ugt3a1/2. The importance of the repression of these two enzymes remains a mystery because of the lack of information regarding substrate specificity of Ugt2a3 and Ugt3a1/2. Activation of AhR by polyaromatic hydrocarbons and TCDD and the subsequent induction of UGT1A enzymes in liver and intestine of humans, rats, and mice is well documented. Up-regulation of human UGT1A1 in liver by TCDD and β-NF occurs via activation of AhR and subsequent binding to the xenobiotic response element in the UGT1A1 promoter region (Yueh et al., 2003). In Caco-2 cells, TCDD induces human UGT1A6 and UGT1A9 (Munzel et al., 1999). Humanized UGT1A mice revealed hepatic induction of UGT1A1, UGT1A3, UGT1A4, UGT1A6, and UGT1A9 by TCDD, as well as UGT1A3 and UGT1A10 in small intestine and UGT1A5 and UGT1A7 in large intestine (Chen et al., 2005). In rats, TCDD and 3-methylchloranthrene induce UGT1A1 and UGT1A6 through a xenobiotic response element, whereas the mechanism of TCDD induction of UGT1A7 has not been characterized (Munzel et al., 1994; Emi et al., 1995; Mackenzie et al., 2003). Rat UGT1A3 mRNA is increased by PCB126 and β-NF (Shelby and Klaassen, 2006). In mice, Ugt1a6 mRNA induction by TCDD in wild-type mice is abolished in AhR-null mice (Nishimura et al., 2005). 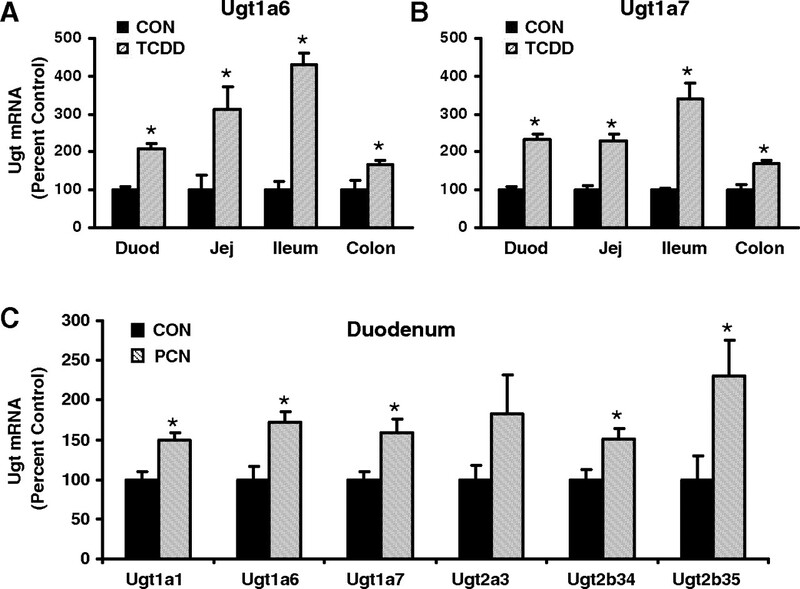 Messenger RNA expression of Ugt1a1, Ugt1a6, Ugt1a7, Ugt2a3, Ugt2b34, and Ugt2b35 in duodenum, jejunum, ileum, and colon of control and chemically treated mice by the bDNA assay. Treatments include prototypical activators TCDD, TCPOBOP, PCN, CLFB, and BHA for each tissue examined. Samples from n = 5/group/treatment were pooled in equal amounts to perform the bDNA for each group in a single well. Data are expressed as relative light units per 10 μg of pooled total RNA. The present study further illustrates the induction of Ugt1a family members by AhR ligands in mice. 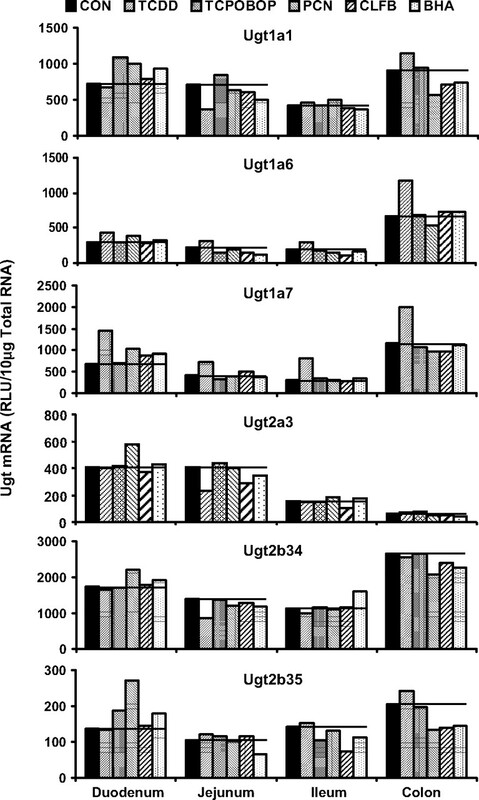 AhR ligands increase mRNA expression of Ugt1a1, Ugt1a6, Ugt1a9, and Ugt2b35 in mouse liver. Similar to induction of human UGT1A6 and rat UGT1A6 and UGT1A7 by AhR ligands, TCDD induced mouse Ugt1a6 and Ugt1a7 in the small intestine (duodenum, jejunum, and ileum) and colon. It is interesting to note that AhR ligands decreased Ugt2a3 in mouse liver, suggesting both positive and negative regulation by AhR in liver, probably because of differences in proximal promoters. PPARα activation by the hypolipidemic fibrate drugs alters lipid metabolism via fatty acid β-oxidation. In addition, PPARα activation by fibrates induces expression of the bile acid-conjugating UGT, UGT2B4, in human hepatocytes (Barbier et al., 2003b). Analysis of Ugt2b mRNA and protein induction by fibrates in PPARα-null mice indicates that PPARα regulates inducible and basal gene expression (Barbier et al., 2003a). In the present study, Ugt2b36 was the only Ugt2b family member induced by PPARα ligands in mouse liver. Mouse hepatic Ugt1a9 was previously shown to be inducible by both PPARα and PPARγ ligands, which is ablated in PPARα-null mice (Barbier et al., 2003c). In the present study, Ugt1a9 mRNA was induced by PPARα ligands. In addition to Ugt1a9 and Ugt2b36, PPARα activators increased mRNA expression of Ugt1a1 and Ugt1a6 in mouse liver. Barbier et al. (2003b) suggested that glucuronidation of catecholestrogens, fibrates, and antidiabetic drugs may be a response to regulate tissue concentrations of such drugs and thereby altering or terminating their hormonal signals. A, mRNA expression of Ugt1a6 in duodenum, jejunum, ileum, and colon treated by corn oil or TCDD by the bDNA assay (n = 5/treatment). B, mRNA expression of Ugt1a7 in duodenum, jejunum, ileum, and colon treated by corn oil or TCDD by the bDNA assay (n = 5/treatment). C, mRNA expression of Ugt1a1, Ugt1a6, Ugt1a7, Ugt2a3, Ugt2b34, and Ugt2b35 in duodenum of mice treated with corn oil or PCN. For parts A, B, and C, data are expressed as percentage. Values are expressed as mean ± S.E.M. Asterisks (*) indicate statistically significant differences between control and treatment groups (p ≤ 0.05). Nrf2 activation is a product of the cellular response to oxidative or electrophilic stress, inducing some phase I and II detoxification enzymes, including UGTs. 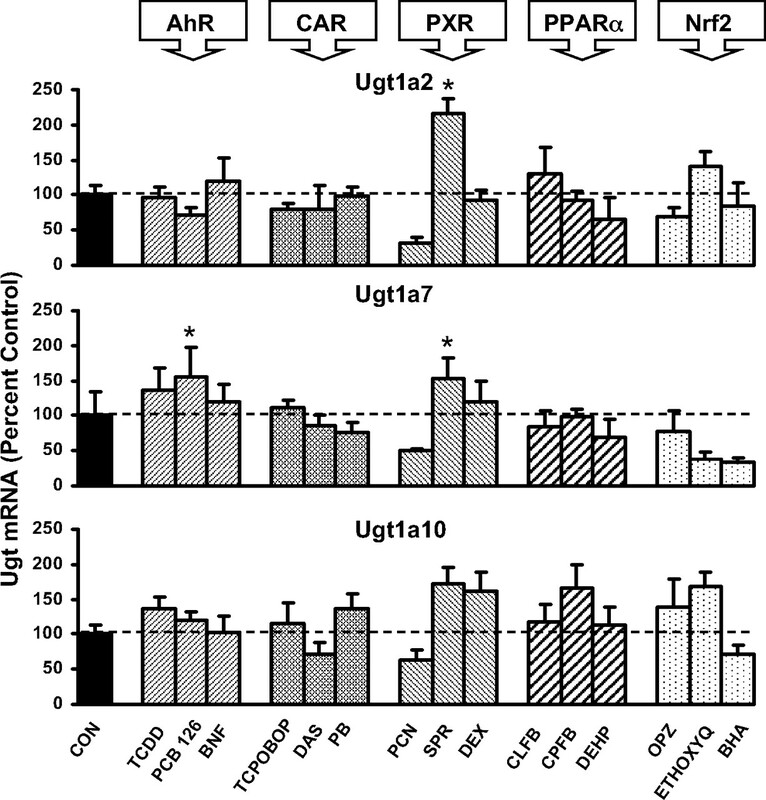 Nrf2 activators increased mRNA expression of Ugt1a1, Ugt1a5, and Ugt1a6 in mouse liver. In contrast, Nrf2 activators repressed expression of Ugt2b1 in liver. Previous studies show that in rats UGT1A6 mRNA and glucuronidation of 1-naphthol (a UGT1A6 substrate) is increased by BHA, ETHOXYQ, and OPZ (Goon and Klaassen, 1992; Buetler et al., 1995; Auyeung et al., 2003; Shelby and Klaassen, 2006). In addition, in Nrf2-null mice, basal glucuronidation activity and Ugt1a6 mRNA are reduced, and Ugt1a6 induction by OPZ is ablated (Enomoto et al., 2001; Ramos-Gomez et al., 2001). In mouse small intestine, sulforaphane increases Ugt1a6 in an Nrf2-dependent manner (Thimmulappa et al., 2002). In the present study, the Nrf2 activator BHA did not increase any Ugt mRNA expression in small or large intestine. Dose and route of exposure of the Nrf2 activators BHA and sulforaphane may explain the observed differences. There are seven mouse Ugt1a isoforms, four of which are abundantly expressed in untreated mouse liver, notably Ugt1a1, Ugt1a5, Ugt1a6, and Ugt1a9 (Buckley and Klaassen, 2007). The present study indicates that activation of the five transcriptional pathways only affects the four aforementioned Ugt1a transcripts. Ugt1a2, Ugt1a7, and Ugt1a10 were not induced by any class of inducer; only one compound, SPR, increased mRNA expression of these genes. However, in rats, UGT1A3 and UGT1A5 mRNA are expressed at low levels in livers of control animals but are readily induced by activators of AhR, CAR, PPARα, and Nrf2 (Shelby and Klaassen, 2006). In conclusion, activation of AhR, CAR, PXR, PPARα, or Nrf2 results in an increase of three or more mouse Ugt genes in liver. Transcriptional activation of Ugt1a1, Ugt1a6, Ugt1a9, and Ugt2b36 is increased by two or more of the five xenobiotic-inducible transcriptional pathways. AhR ligands produced the highest amplitude of gene induction in liver, with Ugt1a6 and Ugt1a9 being induced 3- to 5-fold higher than controls. In duodenum, PCN, a prototypical rodent PXR inducer, increased expression of five Ugts; however, that effect was not observed in more distal regions of intestine (jejunum, ileum, and colon). TCDD, an AhR ligand, increased expression of Ugt1a6 and Ugt1a7 in all portions of the small intestine (duodenum, jejunum, and ileum) and colon. Taken together, these data reveal that activation of a single transcriptional pathway leads to induction of numerous target genes within the mouse Ugt family. These data provide a significant background for understanding the targets of AhR, CAR, PXR, PPARα, and Nrf2 in liver and intestine. Drugs or xenobiotics found to activate one of these transcription factors will influence Ugt mRNA expression, and most likely glucuronidation of specific substrates, whether endogenous or exogenous. Likewise, drugs conjugated by an inducible Ugt isoform may encounter altered metabolism and disposition. This work was supported by the National Institutes of Health National Institute of Environmental Health Sciences [Grants ES09649, ES09716, ES07079]. ABBREVIATIONS: UGT, UDP-glucuronosyltransferase; MEI, microsomal enzyme inducer; CAR, constitutive androstane receptor; PXR, pregnane X receptor; PB, phenobarbital; TCPOBOP, 1,4-bis[2-(3,5-dichloropyridyloxy)]benzene; PPARα, peroxisome proliferator-activated receptor α; AhR, aryl-hydrocarbon receptor; Nrf2, nuclear factor erythroid 2-related factor 2; NQO1, NADPH quinone oxidoreductase; TCDD, 2,3,7,8-tetrachlorodibenzo-p-dioxin; PCB126, polychlorinated biphenyl 126; OPZ, oltipraz; bDNA, branched DNA; β-NF, β-naphthoflavone; DAS, diallyl sulfide; PCN, pregnenolone-16α-carbonitrile; SPR, spironolactone; DEX, dexamethasone; CLFB, clofibrate; CPFB, ciprofibrate; DEHP, diethylhexylphthalate; ETHOXYQ, ethoxyquin; BHA, butylated hydroxyanisole. Auyeung DJ, Kessler FK, and Ritter JK (2003) Mechanism of rat UDP-glucuronosyltransferase 1A6 induction by oltipraz: evidence for a contribution of the Aryl hydrocarbon receptor pathway. Mol Pharmacol 63: 119–127. Barbier O, Duran-Sandoval D, Pineda-Torra I, Kosykh V, Fruchart JC, and Staels B (2003a) Peroxisome proliferator-activated receptor alpha induces hepatic expression of the human bile acid glucuronidating UDP-glucuronosyltransferase 2B4 enzyme. J Biol Chem 278: 32852–32860. Barbier O, Torra IP, Sirvent A, Claudel T, Blanquart C, Duran-Sandoval D, Kuipers F, Kosykh V, Fruchart JC, and Staels B (2003b) FXR induces the UGT2B4 enzyme in hepatocytes: a potential mechanism of negative feedback control of FXR activity. Gastroenterology 124: 1926–1940. Barbier O, Villeneuve L, Bocher V, Fontaine C, Torra IP, Duhem C, Kosykh V, Fruchart JC, Guillemette C, and Staels B (2003c) The UDP-glucuronosyltransferase 1A9 enzyme is a peroxisome proliferator-activated receptor alpha and gamma target gene. J Biol Chem 278: 13975–13983. Bertilsson G, Heidrich J, Svensson K, Asman M, Jendeberg L, Sydow-Bäckman M, Ohlsson R, Postlind H, Blomquist P, and Berkenstam A (1998) Identification of a human nuclear receptor defines a new signaling pathway for CYP3A induction. Proc Natl Acad Sci U S A 95: 12208–12213. Buckley DB and Klaassen CD (2007) Tissue- and gender-specific mRNA expression of UDP-glucuronosyltransferases (UGTs) in mice. Drug Metab Dispos 35: 121–127. Buetler TM, Gallagher EP, Wang C, Stahl DL, Hayes JD, and Eaton DL (1995) Induction of phase I and phase II drug-metabolizing enzyme mRNA, protein, and activity by BHA, ethoxyquin, and oltipraz. Toxicol Appl Pharmacol 135: 45–57. Chen C, Staudinger JL, and Klaassen CD (2003) Nuclear receptor, pregnane X receptor, is required for induction of UDP-glucuronosyltranferases in mouse liver by pregnenolone-16 alpha-carbonitrile. Drug Metab Dispos 31: 908–915. Chen S, Beaton D, Nguyen N, Senekeo-Effenberger K, Brace-Sinnokrak E, Argikar U, Remmel RP, Trottier J, Barbier O, Ritter JK, et al. (2005) Tissue-specific, inducible, and hormonal control of the human UDP-glucuronosyltransferase-1 (UGT1) locus. J Biol Chem 280: 37547–37557. Cheng X, Maher J, Dieter MZ, and Klaassen CD (2005) Regulation of mouse organic anion-transporting polypeptides (Oatps) in liver by prototypical microsomal enzyme inducers that activate distinct transcription factor pathways. Drug Metab Dispos 33: 1276–1282. Dutton GJ (1980) Glucuronidation of Drugs and Other Compounds, pp 3–78, CRC Press, Boca Raton, FL. Emi Y, Ikushiro S, and Iyanagi T (1995) Drug-responsive and tissue-specific alternative expression of multiple first exons in rat UDP-glucuronosyltransferase family 1 (UGT1) gene complex. J Biochem (Tokyo) 117: 392–399. Enomoto A, Itoh K, Nagayoshi E, Haruta J, Kimura T, O'Connor T, Harada T, and Yamamoto M (2001) High sensitivity of Nrf2 knockout mice to acetaminophen hepatotoxicity associated with decreased expression of ARE-regulated drug metabolizing enzymes and antioxidant genes. Toxicol Sci 59: 169–177. Goon D and Klaassen CD (1992) Effects of microsomal enzyme inducers upon UDP-glucuronic acid concentration and UDP-glucuronosyltransferase activity in the rat intestine and liver. Toxicol Appl Pharmacol 115: 253–260. Hankinson O (1995) The aryl hydrocarbon receptor complex. Annu Rev Pharmacol Toxicol 35: 307–340. Hartley DP and Klaassen CD (2000) Detection of chemical-induced differential expression of rat hepatic cytochrome P450 mRNA transcripts using branched DNA signal amplification technology. Drug Metab Dispos 28: 608–616. Honkakoski P and Negishi M (1998) Regulatory DNA elements of phenobarbital-responsive cytochrome P450 CYP2B genes. J Biochem Mol Toxicol 12: 3–9. Huang W, Zhang J, Chua SS, Qatanani M, Han Y, Granata R, and Moore DD (2003) Induction of bilirubin clearance by the constitutive androstane receptor (CAR). Proc Natl Acad Sci U S A 100: 4156–4161. Itoh K, Chiba T, Takahashi S, Ishii T, Igarashi K, Katoh Y, Oyake T, Hayashi N, Satoh K, Hatayama I, et al. (1997) An Nrf2/small Maf heterodimer mediates the induction of phase II detoxifying enzyme genes through antioxidant response elements. Biochem Biophys Res Commun 236: 313–322. Itoh K, Tong KI, and Yamamoto M (2004) Molecular mechanism activating Nrf2-Keap1 pathway in regulation of adaptive response to electrophiles. Free Radic Biol Med 36: 1208–1213. Keller H, Dreyer C, Medin J, Mahfoudi A, Ozato K, and Wahli W (1993) Fatty acids and retinoids control lipid metabolism through activation of peroxisome proliferator-activated receptor-retinoid X receptor heterodimers. Proc Natl Acad Sci U S A 90: 2160–2164. King CD, Rios GR, Green MD, and Tephly TR (2000) UDP-glucuronosyltransferases. Curr Drug Metab 1: 143–161. Kliewer SA, Moore JT, Wade L, Staudinger JL, Watson MA, Jones SA, McKee DD, Oliver BB, Willson TM, Zetterström RH, et al. (1998) An orphan nuclear receptor activated by pregnanes defines a novel steroid signaling pathway. Cell 92: 73–82. Mackenzie PI, Gregory PA, Gardner-Stephen DA, Lewinsky RH, Jorgensen BR, Nishiyama T, Xie W, and Radominska-Pandya A (2003) Regulation of UDP glucuronosyltransferase genes. Curr Drug Metab 4: 249–257. Muerhoff AS, Griffin KJ, and Johnson EF (1992) The peroxisome proliferator-activated receptor mediates the induction of CYP4A6, a cytochrome P450 fatty acid omega-hydroxylase, by clofibric acid. J Biol Chem 267: 19051–19053. Münzel PA, Brück M, and Bock KW (1994) Tissue-specific constitutive and inducible expression of rat phenol UDP-glucuronosyltransferase. Biochem Pharmacol 47: 1445–1448. Münzel PA, Schmohl S, Heel H, Kälberer K, Bock-Hennig BS, and Bock KW (1999) Induction of human UDP glucuronosyltransferases (UGT1A6, UGT1A9, and UGT2B7) by t-butylhydroquinone and 2,3,7,8-tetrachlorodibenzo-p-dioxin in Caco-2 cells. Drug Metab Dispos 27: 569–573. Nishimura N, Yonemoto J, Miyabara Y, Fujii-Kuriyama Y, and Tohyama C (2005) Altered thyroxin and retinoid metabolic response to 2,3,7,8-tetrachlorodibenzo-p-dioxin in aryl hydrocarbon receptor-null mice. Arch Toxicol 79: 260–267. Ramos-Gomez M, Kwak MK, Dolan PM, Itoh K, Yamamoto M, Talalay P, and Kensler TW (2001) Sensitivity to carcinogenesis is increased and chemoprotective efficacy of enzyme inducers is lost in nrf2 transcription factor-deficient mice. Proc Natl Acad Sci U S A 98: 3410–3415. Saini SP, Mu Y, Gong H, Toma D, Uppal H, Ren S, Li S, Poloyac SM, and Xie W (2005) Dual role of orphan nuclear receptor pregnane X receptor in bilirubin detoxification in mice. Hepatology 41: 497–505. Schmidt JV and Bradfield CA (1996) Ah receptor signaling pathways. Annu Rev Cell Dev Biol 12: 55–89. Shelby MK, Cherrington NJ, Vansell NR, and Klaassen CD (2003) Tissue mRNA expression of the rat UDP-glucuronosyltransferase gene family. Drug Metab Dispos 31: 326–333. Shelby MK and Klaassen CD (2006) Induction of rat UDP-glucuronosyltransferases in liver and duodenum by microsomal enzyme inducers that activate various transcriptional pathways. Drug Metab Dispos 34: 1772–1778. Sonoda J, Rosenfeld JM, Xu L, Evans RM, and Xie W (2003) A nuclear receptor-mediated xenobiotic response and its implication in drug metabolism and host protection. Curr Drug Metab 4: 59–72. Sugatani J, Nishitani S, Yamakawa K, Yoshinari K, Sueyoshi T, Negishi M, and Miwa M (2005) Transcriptional regulation of human UGT1A1 gene expression: activated glucocorticoid receptor enhances constitutive androstane receptor/pregnane X receptor-mediated UDP-glucuronosyltransferase 1A1 regulation with glucocorticoid receptor-interacting protein 1. Mol Pharmacol 67: 845–855. Thimmulappa RK, Mai KH, Srisuma S, Kensler TW, Yamamoto M, and Biswal S (2002) Identification of Nrf2-regulated genes induced by the chemopreventive agent sulforaphane by oligonucleotide microarray. Cancer Res 62: 5196–5203. Tukey RH and Strassburg CP (2000) Human UDP-glucuronosyltransferases: metabolism, expression, and disease. Annu Rev Pharmacol Toxicol 40: 581–616. Xie W, Barwick JL, Simon CM, Pierce AM, Safe S, Blumberg B, Guzelian PS, and Evans RM (2000) Reciprocal activation of xenobiotic response genes by nuclear receptors SXR/PXR and CAR. Genes Dev 14: 3014–3023. Xie W, Yeuh MF, Radominska-Pandya A, Saini SP, Negishi Y, Bottroff BS, Cabrera GY, Tukey RH, and Evans RM (2003) Control of steroid, heme, and carcinogen metabolism by nuclear pregnane X receptor and constitutive androstane receptor. Proc Natl Acad Sci U S A 100: 4150–4155. Yoshinari K, Kobayashi K, Moore R, Kawamoto T, and Negishi M (2003) Identification of the nuclear receptor CAR:HSP90 complex in mouse liver and recruitment of protein phosphatase 2A in response to phenobarbital. FEBS Lett 548: 17–20. Yueh MF, Huang YH, Hiller A, Chen S, Nguyen N, and Tukey RH (2003) Involvement of the xenobiotic response element (XRE) in Ah receptor-mediated induction of human UDP-glucuronosyltransferase 1A1. J Biol Chem 278: 15001–15006. Zhou J, Zhang J, and Xie W (2005) Xenobiotic nuclear receptor-mediated regulation of UDP-glucuronosyl-transferases. Curr Drug Metab 6: 289–298.